The 2018-19 NHL season is just over a week old but there's already plenty to talk about. Goal scoring is up and the Caps are keeping the party going, but what's wrong with Vegas? The 2018-19 NHL season is just over a week old but there's already plenty to talk about. Here are eight observations through the first eight days of the season. There have been final scores of 7-0, 7-6, 8-5, 8-2 and 7-4. No, we're not stuck in the 1980s. The speed of the game, possibly the streamlined goalie equipment, and the fact that it's early and teams have been playing loose and have yet to settle into their defensive systems, are responsible for the goal-scoring spree. A whopping 282 goals have been scored through the first 44 games, for an average of 6.41 per game. That's up from an average of 6.07 through 44 games last season. The 3-1-0 Maple Leafs can't be pleased by their 4.25 goals allowed per game (ninth highest in the league) and their 31.8 shots per game surrendered (15th highest). But, led by Auston Matthews, John Tavares and defenceman Morgan Rielly they have scored five goals per game. Only the defending-champion Washington Capitals have produced more at six goals per game. 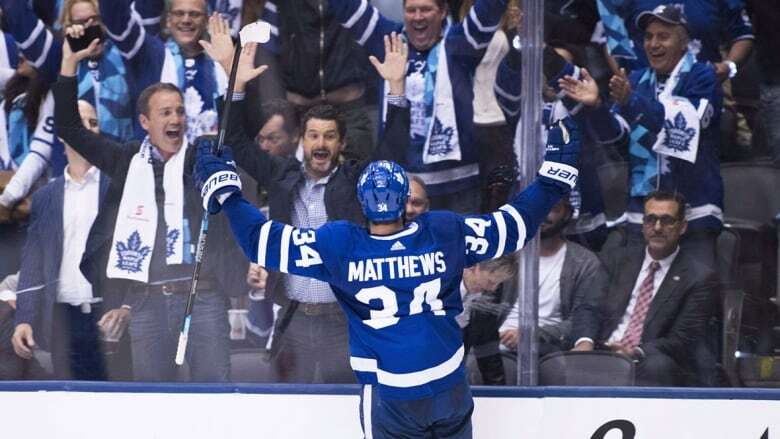 Matthews has seven goals and three assists in his four-game point streak to start the season, while Tavares has scored six goals in four games with his new team. They became the first teammates to score six or more times in the first four games of the season since Wayne Gretzky and Luc Robitaille each scored six times to begin the 1988-89 season with the Los Angeles Kings. Jonathan Toews has played plenty of hockey in his first 11 seasons with the Chicago Blackhawks. He has suited up 956 times, including 791 regular-season games, 128 playoff games and 37 more outings for Canada at the world championships, Olympic Games and 2016 World Cup of Hockey. The three-time Stanley Cup champion isn't usually Mr. October in terms of production, until this year. Missing the playoffs for the first time since his 2007-08 rookie season seems to have left Toews hungry and fresh, and that's why he has scored five goals and six points in his first three games this fall. The Anaheim Ducks have been the surprise team early on. Injuries to key players like Corey Perry, Ryan Getzlaf and Ryan Kesler, who played his first game on Wednesday, as well as a contract dispute with forward Nick Ritchie, haven't stopped the Ducks from going 3-0-1. The Ducks are quick and have the youngest team in the league (their average age is 25.9), led by 19-year-old Isac Lundestrom as well as 20-year-olds in Sam Steel and Max Comtois and Troy Terry, 21. With three goals and six points in his first three games, Vancouver Canucks 19-year-old rookie Elias Pettersson has filled in nicely after the retirement of countrymen Daniel and Henrik Sedin. Pettersson packed in plenty of experience back home last season. He performed for Sweden at the world juniors and world championship and he also led the Vaxjo Lakers HC to the Swedish league championship, winning the scoring title as well as regular-season and playoff MVP honours. Senators 19-year-old rookie Brady Tkachuk broke out for a two-goal, one assist effort in just his second game as a pro in Ottawa's 7-4 loss at home on Wednesday. He now has the family bragging rights because older brother Matthew, a Calgary Flames forward, needed four games before he scored his first goal and their father, Keith, required five outings for his maiden goal. Now if only the Senators can attract more fans to the Canadian Tire Centre than the announced crowd of 13,215 on Wednesday. The title-holding Capitals and finalist Vegas Golden Knights assembled in the United States capital on Wednesday for a Stanley Cup rematch. The Capitals skated to a 5-2 victory to remain undefeated in regulation time with a 2-0-1 record. The Golden Knights are a different story. They have gone 1-3-0 and have been outscored 15-8 in their four outings. They began their expansion season 3-1-0 and it took them 11 games to lose their third game. The difference? One is the quality of opponents — the Golden Knights played a home-and-home with lowly Arizona in Games 2 and 3 last season. Another is that goalie Marc-Andre Fleury has struggled with a .846 save percentage. Also, key additions like Max Pacioretty and Paul Stastny, out with a lower-body injury, have yet to fit in. Where are Taylor and Connor? I'm all for growing the game and still believe not participating in the Winter Olympics last February was a massive mistake for the NHL, but it also was a mistake having Taylor Hall and Connor McDavid start the season in Sweden. We've seen Hall and McDavid, the reigning Hart Trophy and Ted Lindsay Award winners, respectively, in action only once in eight days. It would have been nice to see them join the early-season scoring party. Steven Stamkos and the Tampa Bay Lightning also have played only once so far.